Tellez put together a banner week for the Buffalo Bisons. Out of his 10 hits, 6 went for extra bases. The big first baseman also stole his 5th base of the season against the Durham Bulls. After a year without much power, Tellez is back on track with 10 HR in 273 AB while holding a sub-16% K% and nearing 10% with his BB%. His profile is very interesting for fantasy whenever he gets a chance to show his stuff in the majors. The Blue Jays prospect is still only 23 with a lot of minor league production in his past. It’s great to see the dingers coming back into the overall game for Tellez. The AAA pitcher this week also comes from the Buffalo Bisons. Reid-Foley had another stellar campaign in his 2 starts against the Norfolk Tides and Durham Bulls. He allowed only 3 hits, 3 walks, leading to 1 ER while striking out 12 batters and generating an elite swinging strike rate of 17%. The 22-year-old has been impressive thus far in his AAA debut. It would be awesome to see if he could get a cup-of-coffee for the Jays in September, but Reid-Foley has a future in a major league rotation regardless if it begins later in 2018. Scavuzzo is a Dodgers prospect that has not generated much hype after being in the system for 5+ years. This week certainly was special for the 6’4″, athletically built outfielder. He is now 24-years-old and did not perform well in AAA to start the year. However, his time with the Drillers this season has been the most successful sample in his entire career. The 4 HR this week brings his total to 18 on the year with 8 SB and a triple-slash of .292/.331/.581, for the Drillers that line is .314/.348/.638. It is an impressive season for someone with a lot of tools who was way off the radar. The Mobile BayBears REALLY dislike this big lefty after this week. Vasquez faced the AA affiliate of the Los Angeles Angels twice in one series and pitched 4 spectacular innings. The 24-year-old struck out 5 batters in each outing, gave up 1 hit in each, and utterly dominated in both. He won’t make a fantasy impact long-term, but this shows the potential he holds as a lefty specialist out of the bullpen. The fact that he went multiple innings in these games also displays a higher ceiling as a back-end, high-leverage option. This week, the large Dominican first baseman did what he does best, mash baseballs. He is on pace for the best home run total in his career and hitting 5 to achieve this award certainly helped. Pimentel is safe to stay off fantasy radars for now. However, this huge physical specimen must be a joy to watch at the ballpark. He is interesting enough for ranking on our Top 50 Preseason Athletics list and is providing mainly the same value he’s had since debuting in 2012. Anyone in the Stockton area should head out and see this man hit a baseball once or twice. At the moment, Medina is inflating with some serious prospect helium. Jason Woodell, a writer for Prospects1500, took to a group DM this week simply telling everyone to hype this stud. The Phillies prospect was nearly flawless this week. 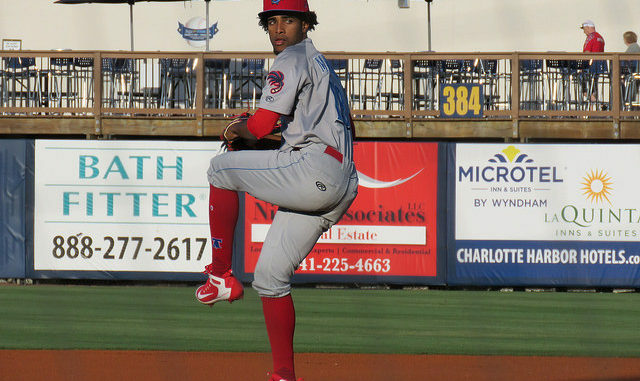 After giving up 13 ER in his past 3 starts, Medina destroyed the Florida Fire Frogs over the course of 7 innings. His performance in the Futures Game was also impressive, despite the mammoth shot by Mets prospect Peter Alonso. Let’s all do ourselves a favor in fantasy and buy into what Jason is telling us, go out and buy this kid in dynasty leagues! Rennie is an interesting case, and one of the best stories of any #POTW this season. His first 10 starts this season came for the Evansville Otters, which is an Indie ball team in the Frontier League. After posting a 2.31 ERA with 70:20 K:BB in 62.1 IP, the Mets signed this former Orioles draft pick. His debut in the Mets organization includes 2 ER in 21.2 IP with only 3 BB in 4 starts. This week caused Rennie to pop-up on our radar on Prospects1500, and his story is one that I can’t wait to follow for the rest of the season. Martinez is one of the hottest international prospects to come to the States in the last few years. He is working himself through the ranks now in Spokane for the Rangers. This week showcased more of the tools we were dreaming on when hearing stories of the speed, power, and a polished bat. He is yet to dominate in the way we thought he would upon his stateside debut. However, this Cuban product is a long-term prospect, that is rawer than expected, with the same ridiculous upside. The 22-year-old is 2-for-2 through three innings. Shortridge is another mid-round college draft pick performing to a high level during his debut. Selected by the Pirates in the 4th round this year, this right-handed Cal product now has 37:5 K:BB in his first 28 innings, which have all come in Short Season ball. He is well-built, 6’3″/196 lbs., with all of the pedigree he needs to survive as a prospect long-term. It is fantastic to see so many names from this year’s draft starting off with these impressive performances. This week we have two prospects taken this season and we can count on many more as the minor league season hits the final stretch. Morales is entering his 3rd year in the Rangers system. He hasn’t done much to impress thus far and repeated the DSL in 2017. Nevertheless, he destroyed the competition this week. Morales racked up 9 total hits, 8 of which went for extra bases including 4 homers. This low-level catcher could potentially work his way into some more hype as he continues to increase his power year-by-year. This season he currently sits at 5 HR in his first 13 games. Hopefully, he continues to make these changes and rises up the ranks to see if this tool sticks at the higher levels. Urias is an absolute monster on the mound. This 17-year-old, born in 2001, stands 6’6″ and already throws 90+ MPH. This week he displayed the upside he carries as he struck out 14 batters in 11 innings for the DSL Phillies. Considering his size, showing this kind of control at such a young age is phenomenal. Urias should be rising up lists based on his stuff, size, and reportedly advanced approach on the mound. The international prospect from Mexico is one that I will be monitoring closely to end the year.